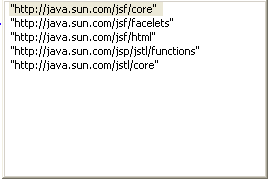 Shows expected namespace content assist options for a basic Facelet xhtml. current 17:40, 21 May 2008 271 × 184 (2 KB) Cameron.bateman.oracle.com (Talk | contribs) Shows expected namespace content assist options for a basic Facelet xhtml. This page was last modified 17:40, 21 May 2008 by Cameron Bateman.